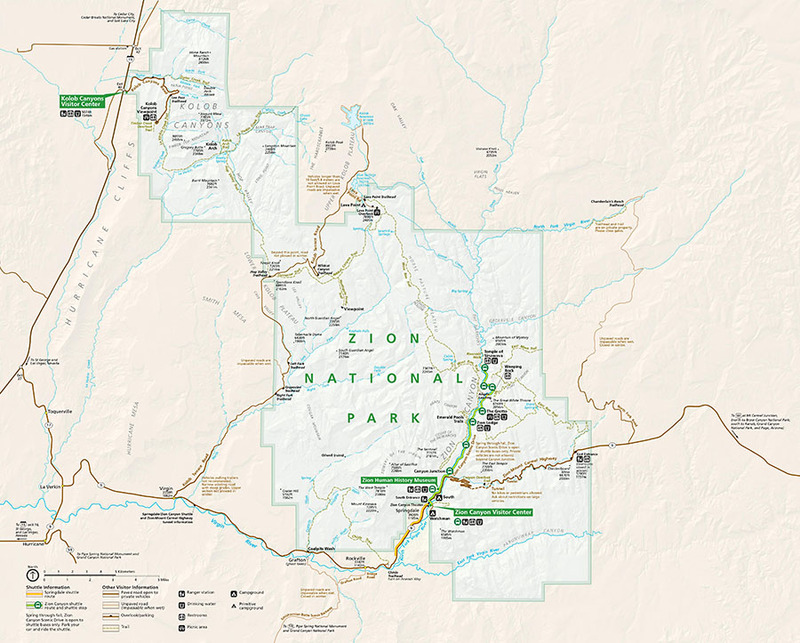 In the early 90s we were in graduate school at the University of Utah in Salt Lake City, and that gave us an opportunity to explore some of the wondrous parks in the southern part of the state. 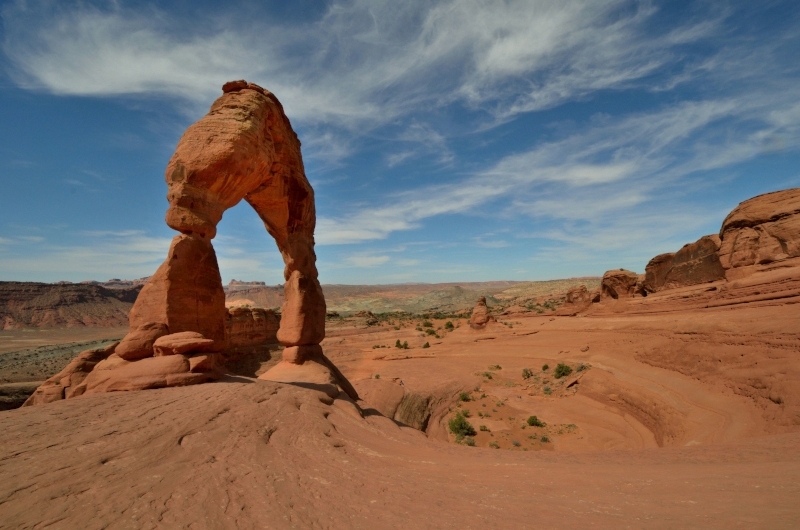 Arches National Park was always our favorite, with glowing red rock in surreal formations. 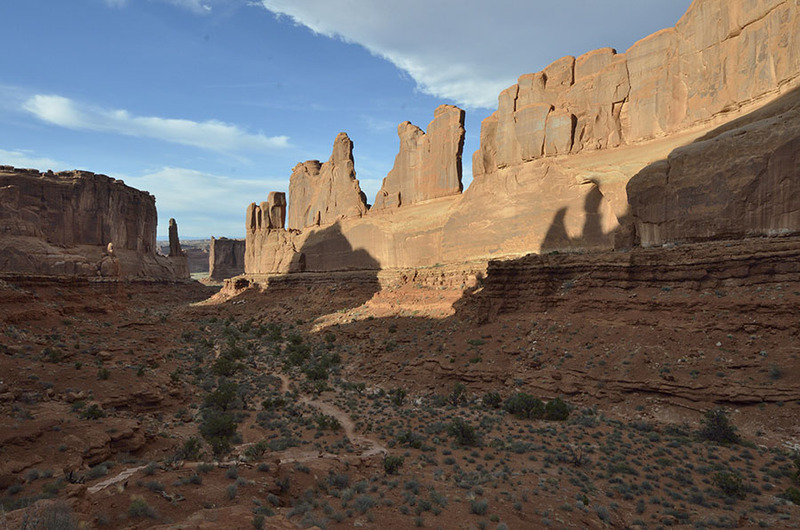 There are over 2000 arches in the park, though we only saw about 15 of them since many are difficult to access. 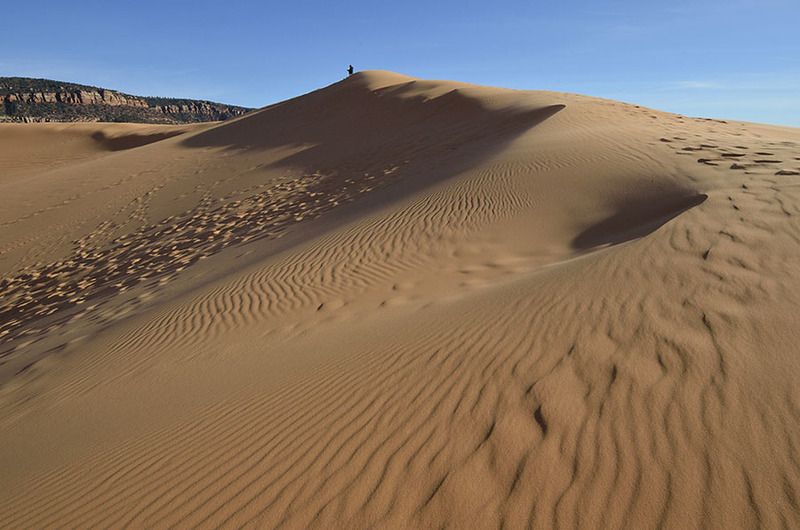 The landscape was formed by deposits of sand and silt many millions of years ago when the state was part of a massive inland sea, drying and flooding multiple times. 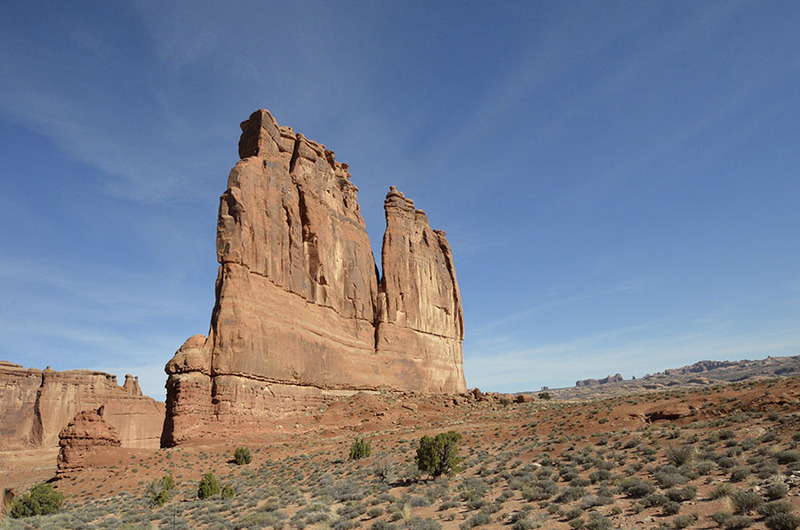 Sandstone formed over salt domes, and the domes eventually bulged, causing the rock to crack in parallel lines. 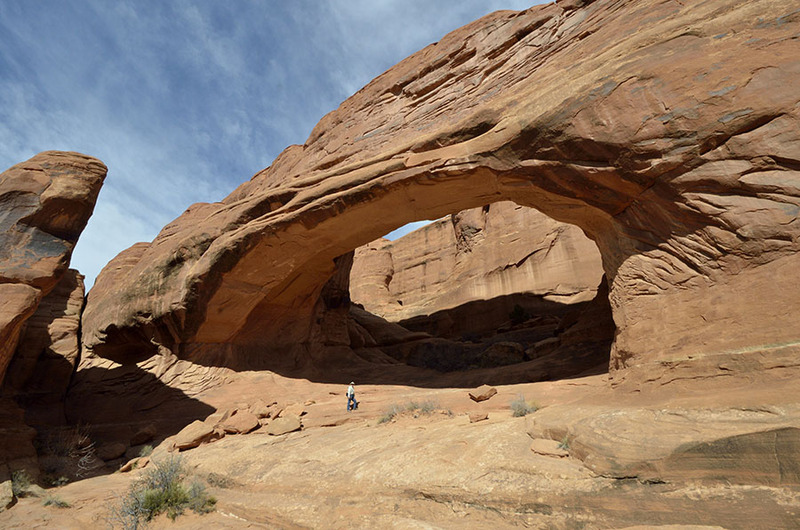 Water and wind began the erosion process, shaping rock into fins and dissolving some of the “glue” between grains of Entrada sandstone to form arches… like the Window arches… …the Landscape arch… …and the iconic Delicate arch, just to name a few. 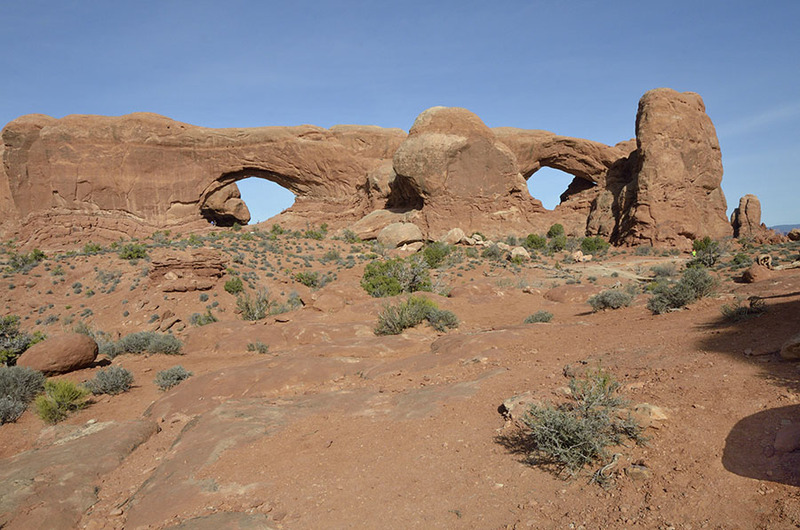 Geologic forces are also responsible for shaping Arches, starting with the Moab Fault which split the rock face and shifted the west side 2600′ higher than the east side. 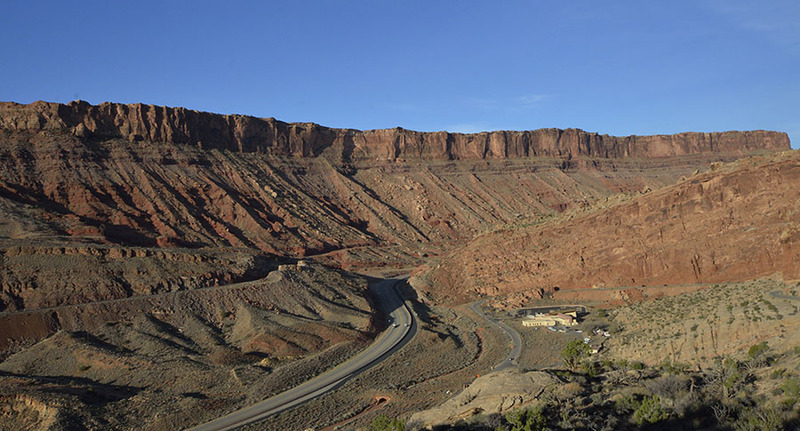 The road just outside the park follows the fault, which means that if the earth starts to shift again it could make for some dicey driving! In addition to arches, flat panels of sandstone stand proudly in the landscape such as Park Avenue… …and the Courthouse. 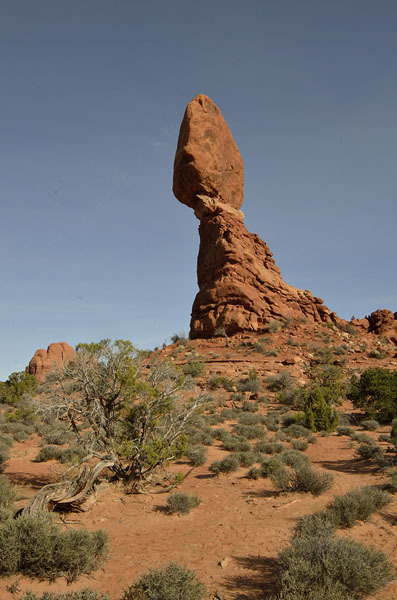 Balanced Rock is another well-known formation – we’re always glad to see its 128′ still standing… …and we keep wondering what the Three Gossips are whispering about. 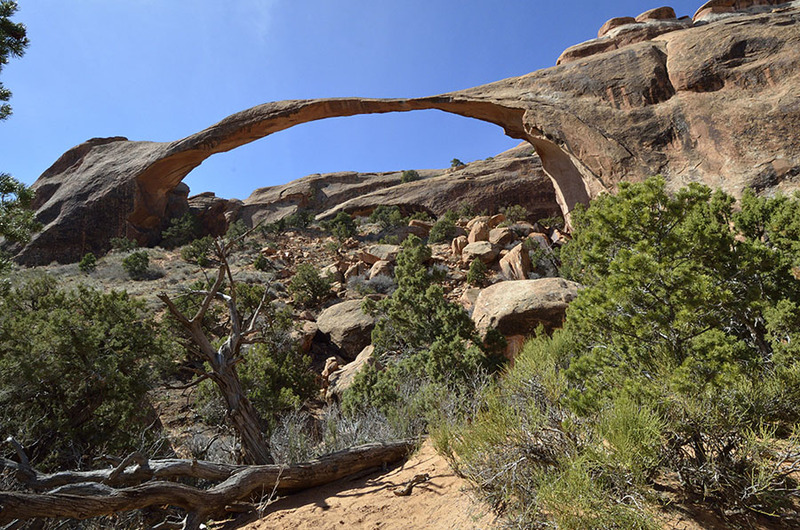 While some of the arches are easy to get to and lots of fun to climb around, such as the Double Arch… …some are a short hike through the improbable landscape at the Devil’s Garden… …to see the Sand Dune arch… …and the Broken arch. 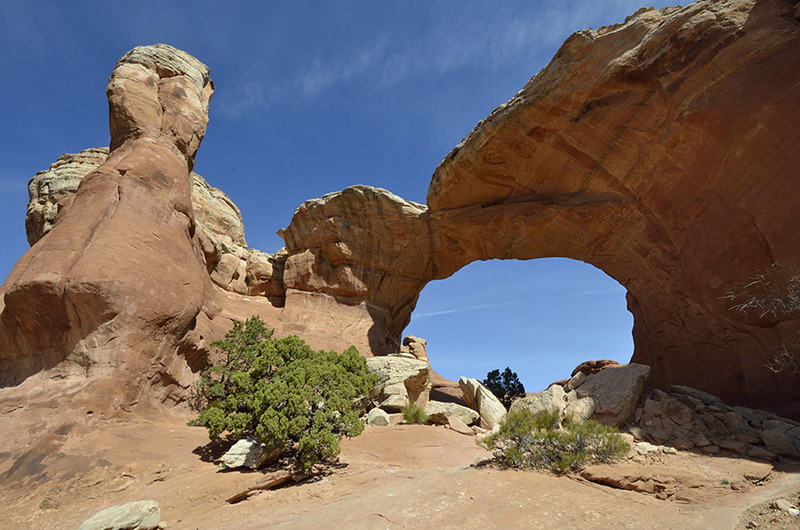 We also wanted to see some of the more remote arches, and first on our list was Tower arch. 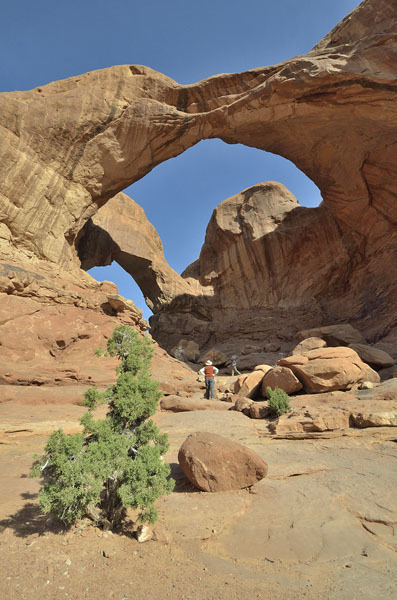 This arch can be reached by a very rocky 4-wheel drive road and a short hike (we found the road to be too rough for us) or a 9 mile dirt road and a moderately difficult 2.5 mile hike, scrambling up to a rock ridge and a brutal slog on a few steep sand dunes – but it was worth it! Can you spot Jim under the arch? 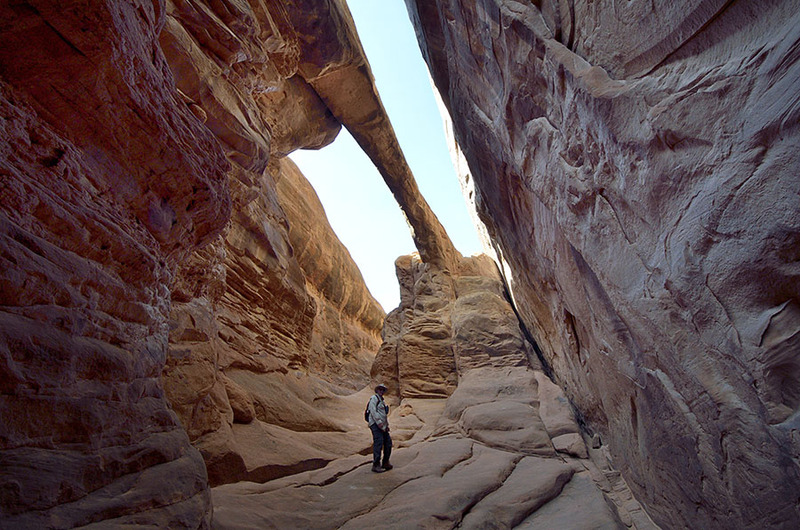 The view from the arch to the west was gorgeous, and we loved scrambling around underneath it. 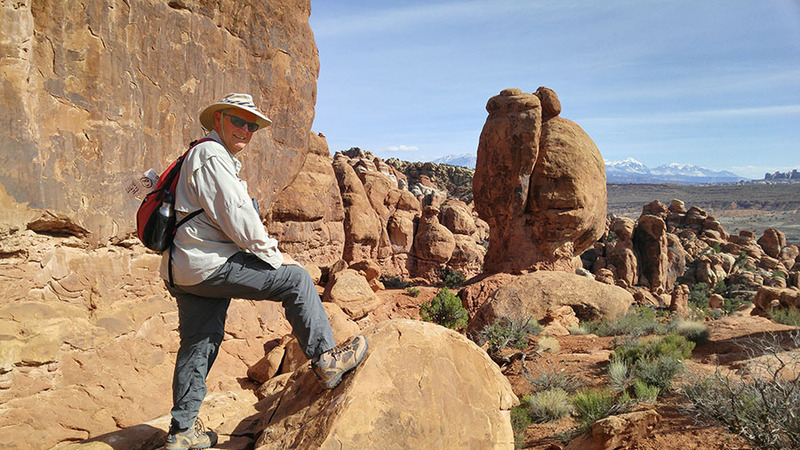 The next day we got a backcountry permit to venture into the Fiery Furnace area – a more challenging part of the park requiring a lot more rock scrambling, where trails don’t exist, and with a risk of getting disoriented. 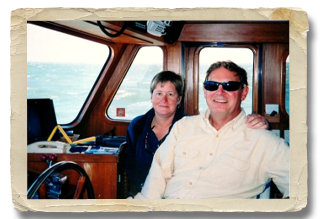 We took it slowly and carefully, backtracking often to find our way among the tall fins to discover a small arch we could crawl through, and eventually we found Surprise arch after making our way carefully along a narrow ledge. 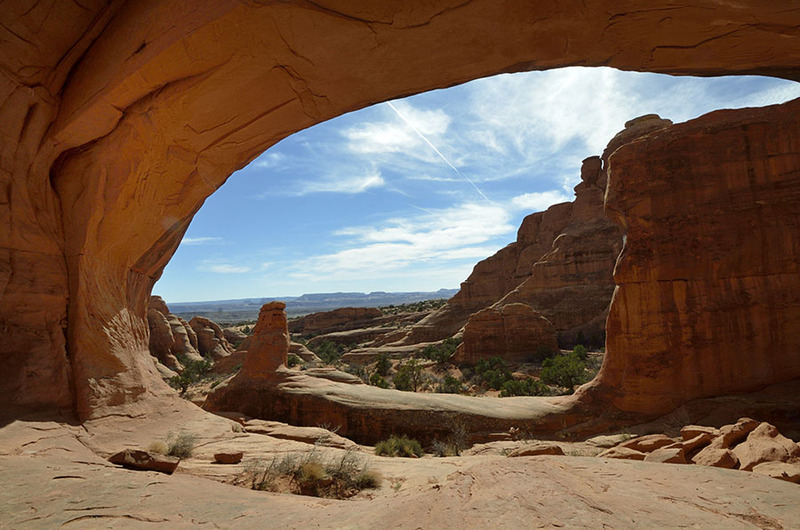 Arches never ceases to amaze and delight with its many shapes and hidden treats, and I think it’s still our favorite of Utah’s treasures. 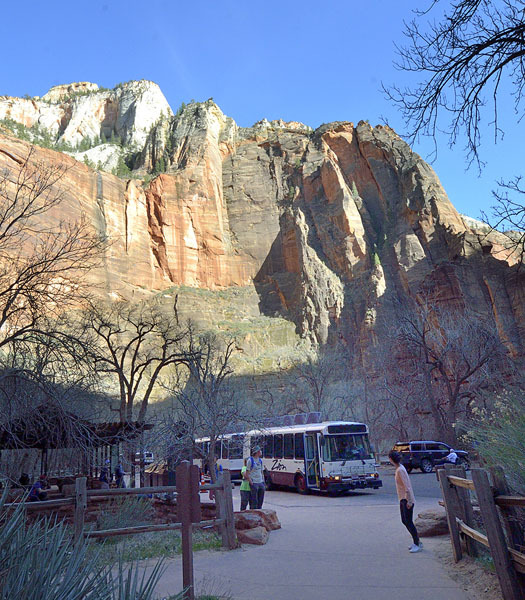 Although the beauty of Zion’s main canyon is compelling, the Spring Break crowds were a little discouraging, so we drove into the narrow 1930s era tunnel through a mountain to explore the very different east side of the park. 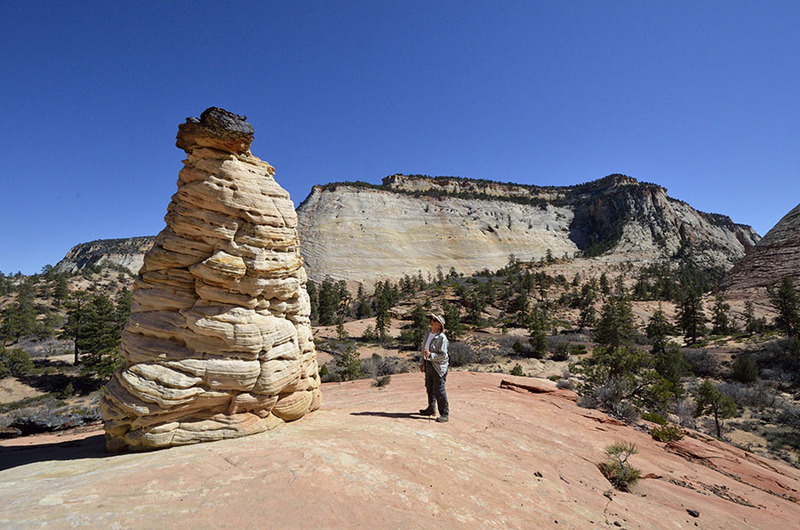 Checkerboard Mesa is one of the features on this side, as well as slickrock sandstone mountains instead of the vertical cliffs found in the main canyon. We found the east side to be much less crowded, and although there are few formal hiking trails there is plenty of territory to explore off the beaten path. 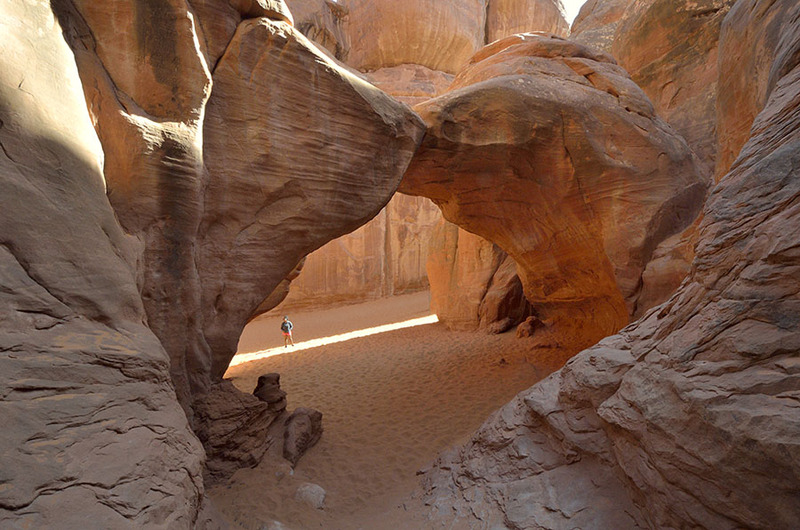 Our favorite exploration scrambled down into a wash with steep walls shaped by raging water. 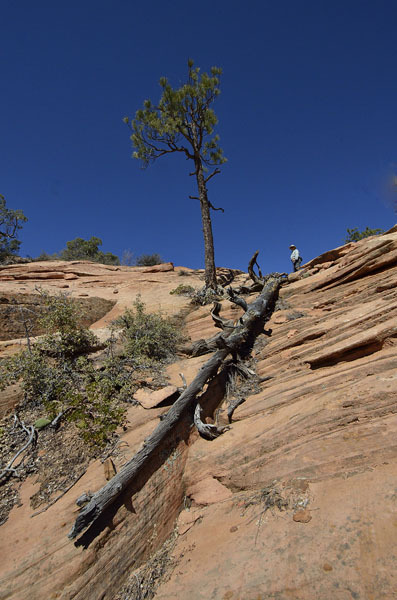 With clear skies and weeks without rain in the forecast we felt safe down there, finding interesting rocks and shapes in the sandstone that showed the effects of wind and water. 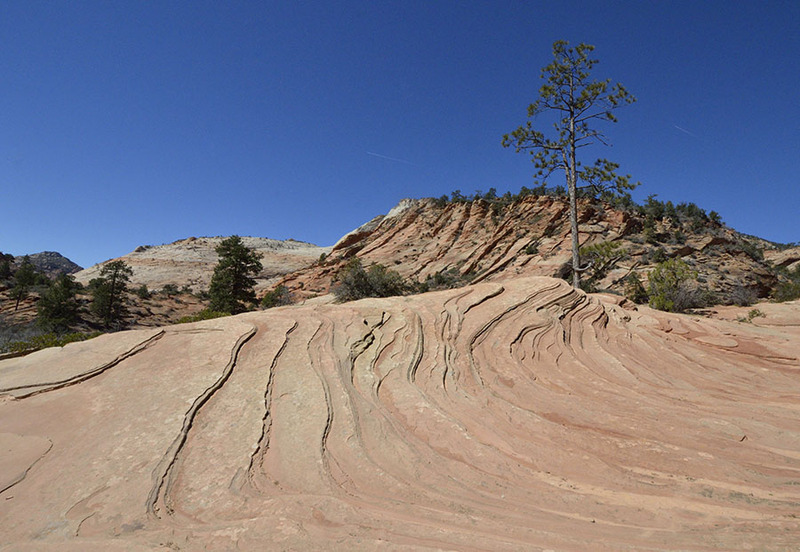 Rocks look like waves or ripples on a beach! We had a steep scramble to get out of the wash and back up to the road, but we had the entire area all to ourselves and we loved having some quiet time to enjoy the landscape. 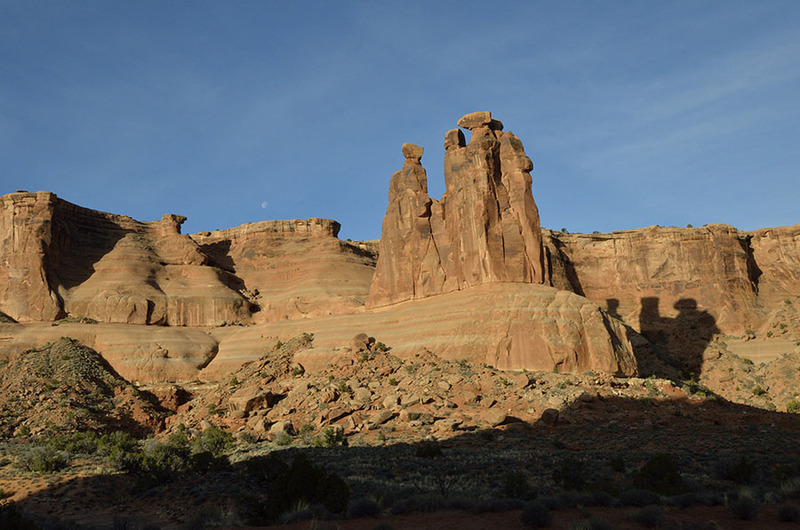 After a brief snowball fight near Checkerboard Mesa, we spotted a hoodoo (rock spire) up on a hillside, so we found a place to park and headed up the slickrock to check it out. 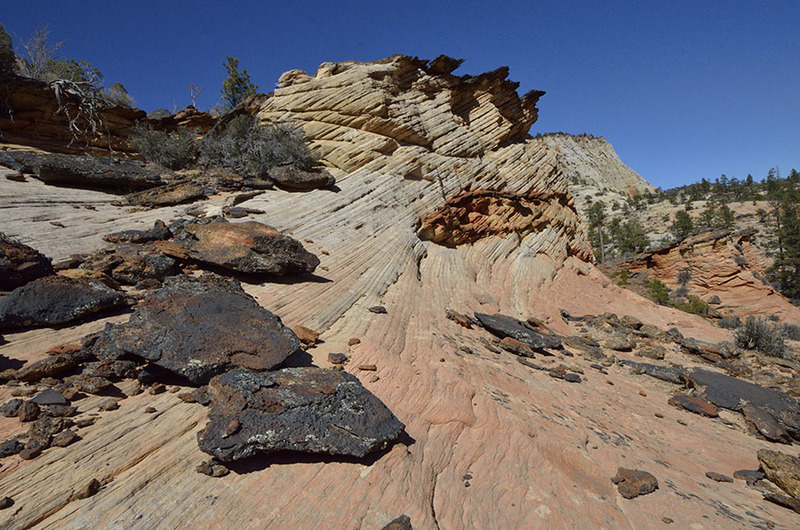 We couldn’t figure out what caused the black on top of the hoodoo, but there were other chunks of the black rock nearby that really popped against the red and yellow sandstone. A few other spots caught our eyes and we had a ball wandering around the odd landscape, wondering at the forces of nature that created this amazing place in the high desert. 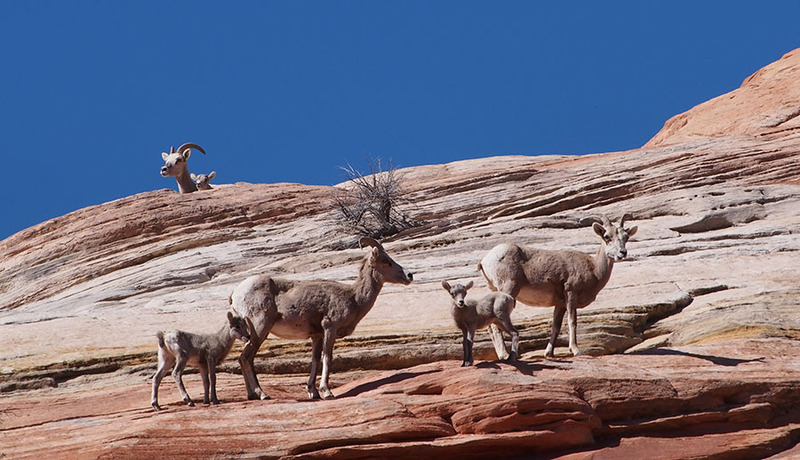 But there was one final treat – desert bighorn sheep! 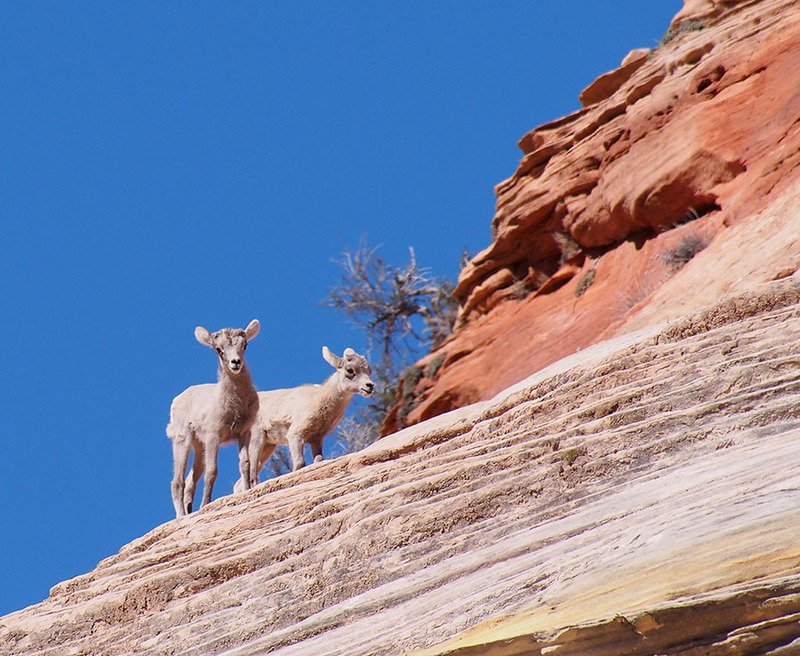 Just as we were driving back towards the tunnel, we spotted a small herd of sheep on the mountainside that stayed around long enough for me to change lenses and get to a good vantage point. There were several lambs… …and they wagged their tails like crazy when they could get their mother to pause long enough for them to nurse. Wonderful! It was the perfect way to wrap up our first visit back to Zion in 25 years. 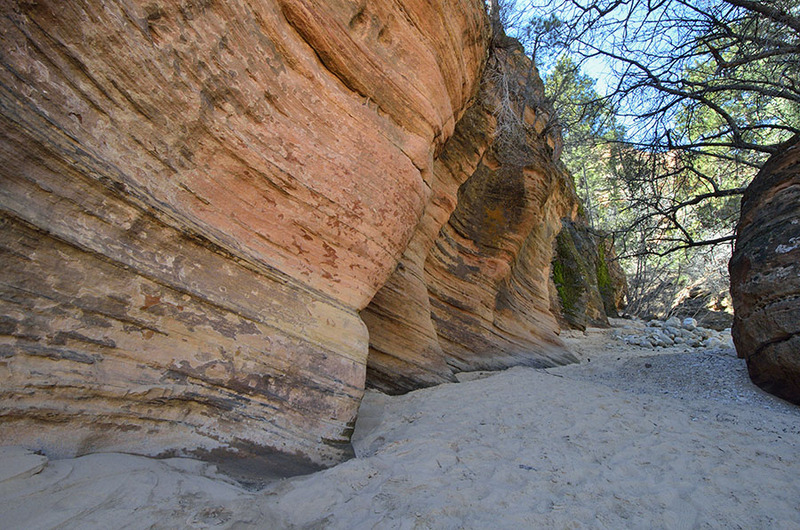 Soaring cliffs of sandstone narrowing to slot canyons cut by the Virgin River are some of the special features of the popular Zion National Park, located in the southwestern corner of Utah. 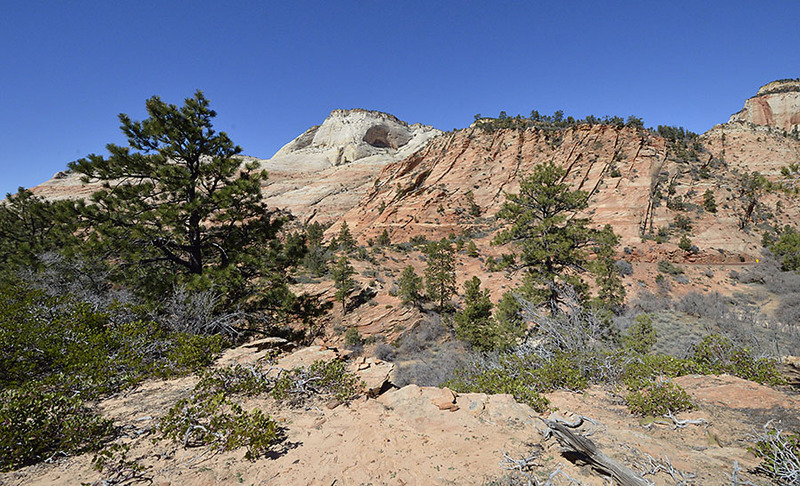 Zion sits at the edge of the Colorado Plateau that has been uplifted and tilted by plate tectonics, then shaped by wind and water into amazing shapes. 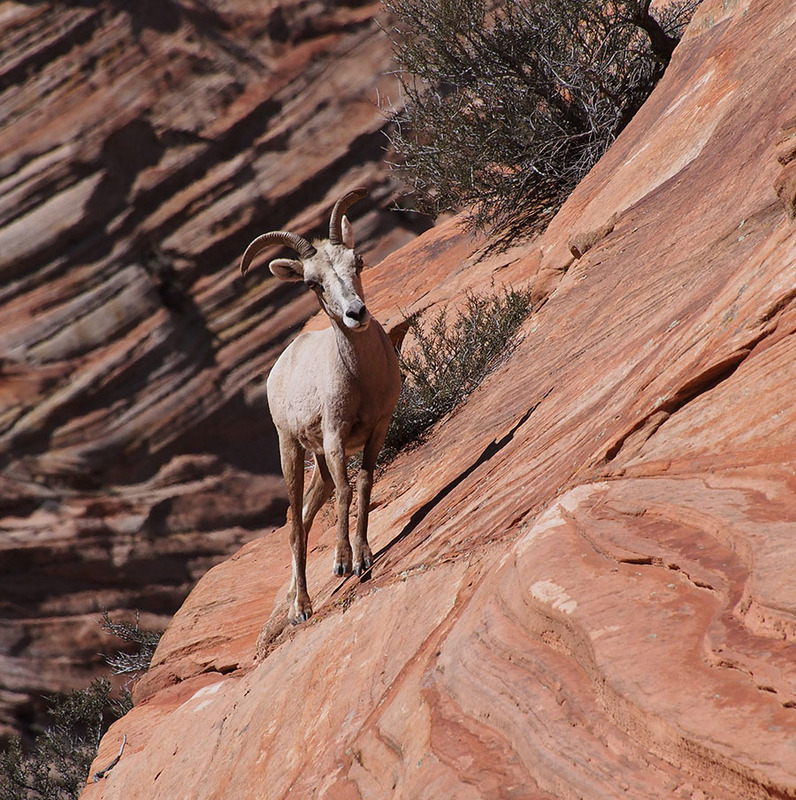 Just to bend your mind a little – the bottom layer of rock in Zion is the top layer of rock at the Grand Canyon to the south. 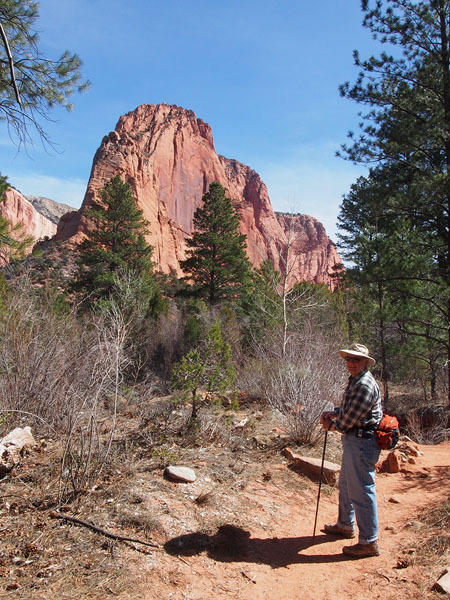 The park has three main sections to explore – the less visited Kolob Canyons to the north, the main (popular) section that runs along the Virgin River, and the East Canyon accessible by road through a mountain tunnel. Of course, we explored them all. 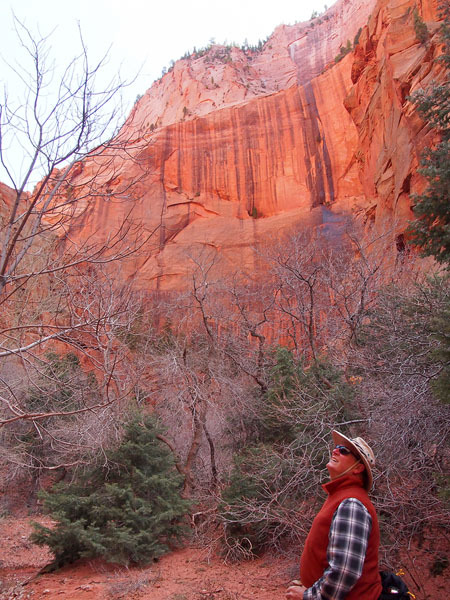 We arrived to the area on a weekend so we headed to Kolob Canyons on the NW corner to avoid crowds in the main part of the park. 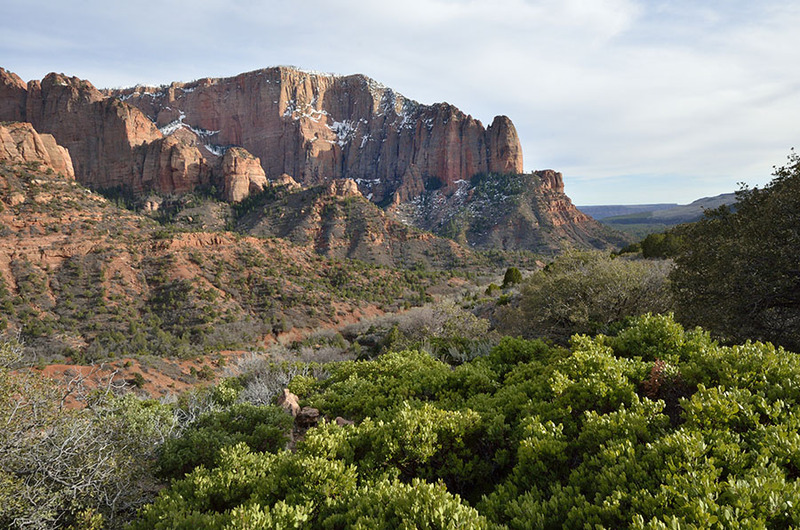 Kolob has a 5 mile scenic drive with gorgeous views at the end, even better from the viewpoint that’s a mile-long hike from the parking area. Photographs could never do justice to reality – they just don’t convey the sense of majesty here. 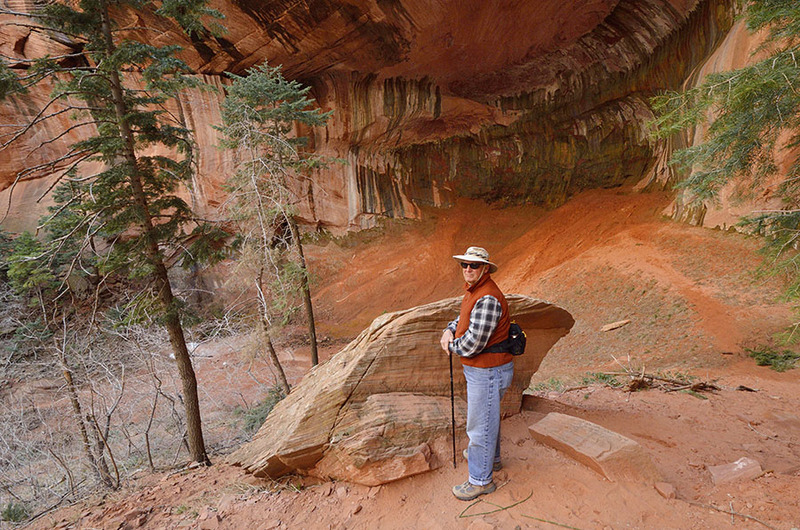 Farther down the canyon we took a 5 mile hike into the finger canyon at Taylor Creek, surrounded by red Navajo sandstone cliffs… …that gradually narrow to a double-arched alcove at the end. The sun lit up the wall of one side of the narrow canyon, and the reflected light made the wall in shade glow a deep fiery red – stunning. We were a little early for spring – a few willows started sprouting their fuzzy gray pods, but ice chunks were still falling from the little waterfall at the alcove. I’ll bet it’s especially beautiful in the fall. The next day we ventured into the main part of Zion, now so popular that no cars are permitted in the main canyon from mid-March through late November. 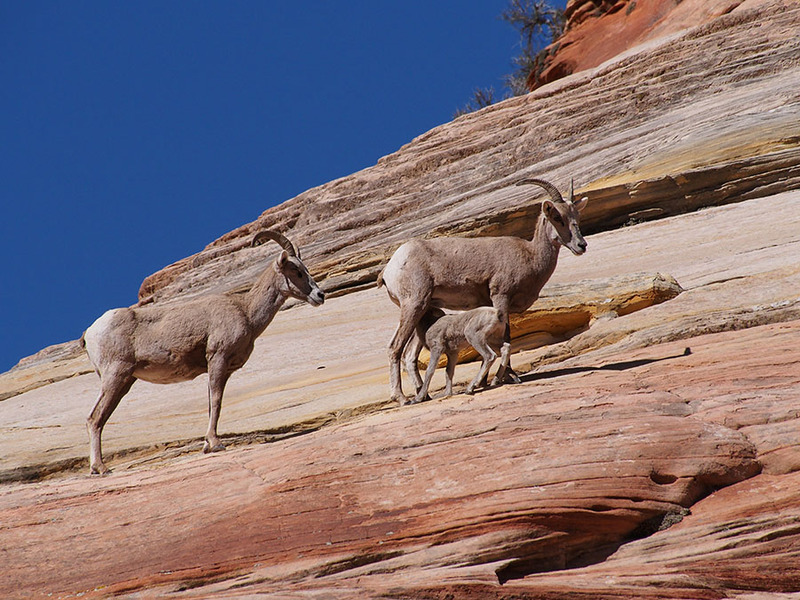 We last visited Zion 25 years ago, and the increase in popularity shocked us. People are loving many of these parks to death! The bus system is very efficient, but with Spring Break crowds we were a little disappointed in the lack of solitude to appreciate this very special place. 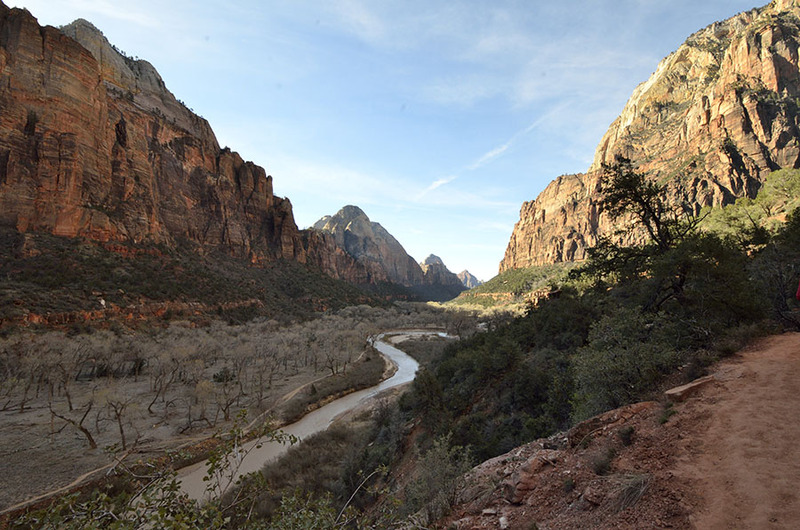 The views in the main canyon are breathtaking, and would have been even more beautiful if the cottonwoods along the Virgin River had more spring color. We were about two weeks too early! 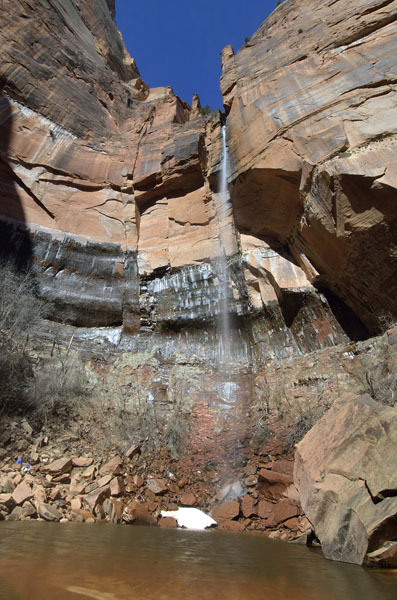 There are a number of hikes in the canyon – we chose to make an early start to see the Emerald Pools, though the trail to the lowest one was closed because of a rock fall. The upper pool was a perfect spot for a lunch break. Beautiful! 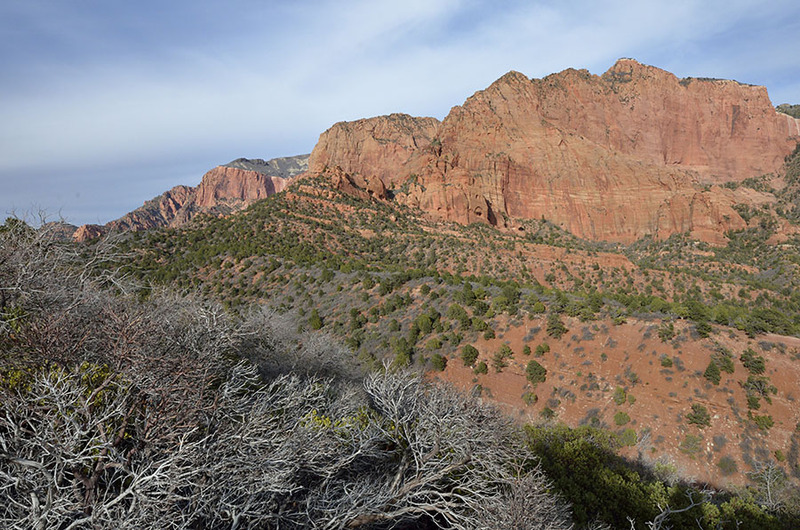 We did a few other short hikes in the afternoon, skipping the famous but strenuous climb to Angel’s Landing. We did that hike 25 years ago with our friend Dave, though I never made the final scramble (which is done while clinging to a chain to keep from falling off the cliff) because I had bronchitis. Jim did it carrying a 20 lb. knapsack full of camera gear and tripod. We capped off our day walking up to the end of the canyon called The Narrows. We were hoping to hike up The Narrows, which involves wading in the river and keeping a very sharp eye on the weather – flash floods can occur from storms even far away, and there have been fatalities here. 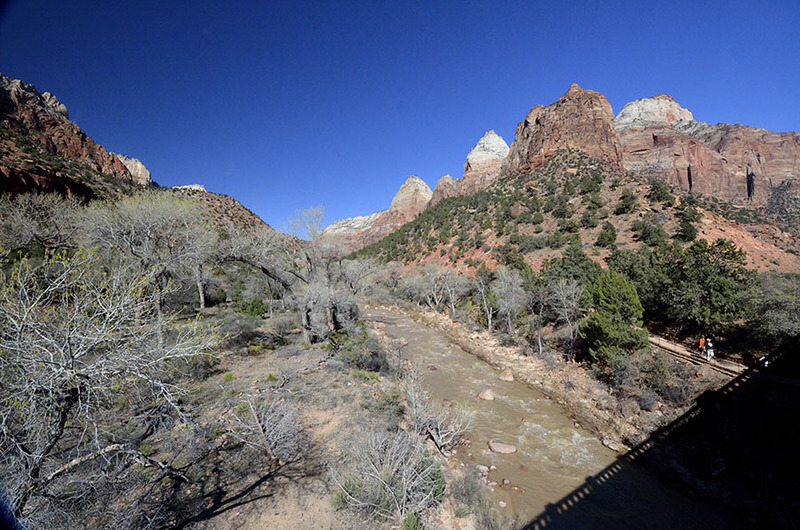 Unfortunately the spring runoff and recent rain turned the Virgin River into a muddy torrent so the Park Service closed the area for safety. Autumn would be a better time to try. Regardless of the little disappointments, the main canyon was still a treat to see and explore. Although we prefer the solitude and quiet of wild places, it has been fun encountering other people on the hiking trails. Despite the current political climate and negative tone on the news, virtually everyone we met on the trails was considerate and polite. Smiles and greetings were genuine and warm, people who patiently stood off to the side to let others pass were rewarded with lots of thank you’s. It made us feel good about our fellow humans – I wish more of the news stories would focus on the many things that are positive. 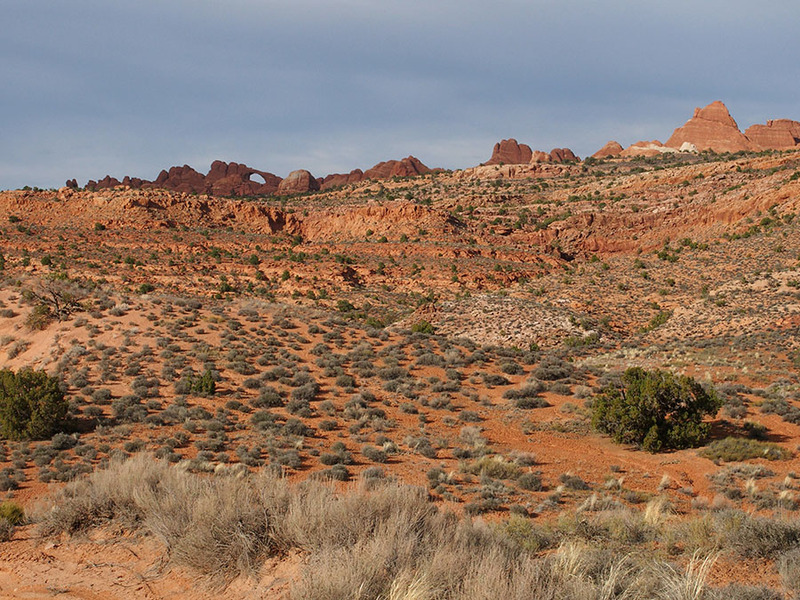 From Las Vegas we headed into Utah to make an extensive exploration of “color country” – a swath of state and national parks that spans the southern part of Utah from west to east. 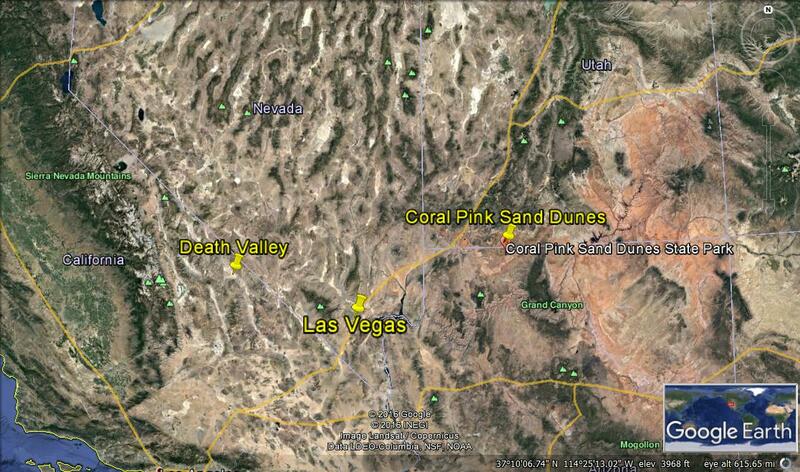 We started with a little gem of a state park – Coral Pink Sand Dunes not far from the town of Kanab. We were surprised to see large sand dunes in Death Valley, and were equally surprised to find an area with nearly 6 square miles of dunes here. 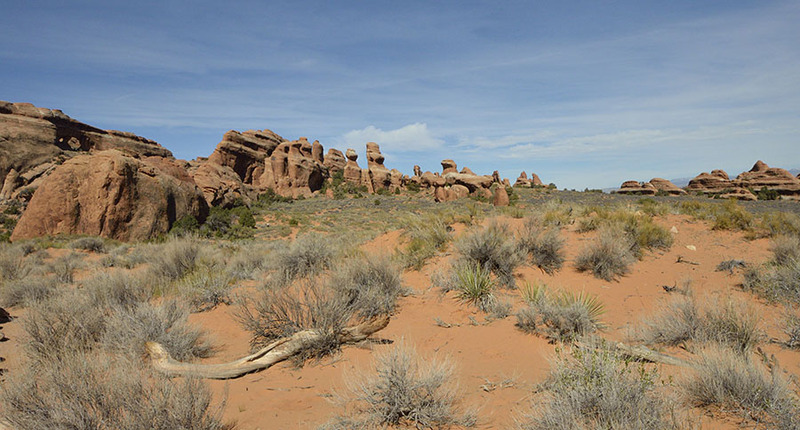 Pink colored Navajo sandstone, eroded by wind, is concentrated in this area by a pinch between two mountains, producing natural sand dunes that are between 10,000 and 15,000 years old. 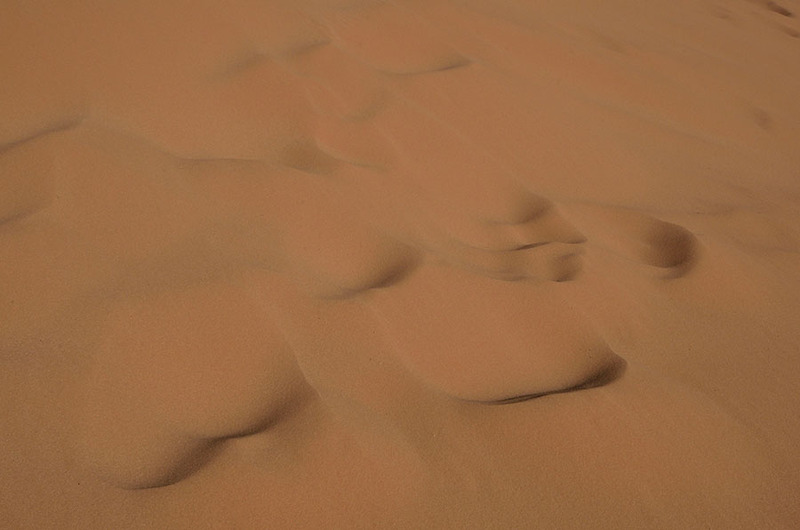 Wind is constantly funneling, blowing and moving the sand, erasing traces of man-made tracks within minutes. 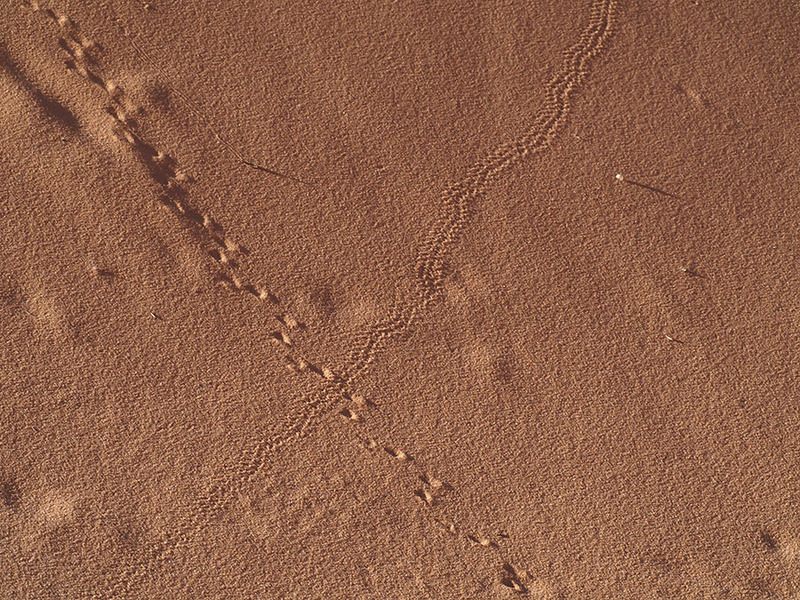 Desert animals, lizards and insects make their home near the edges of the dunes where grasses and other plants create some shade, leaving odd tracks and trails as evidence of their movements. 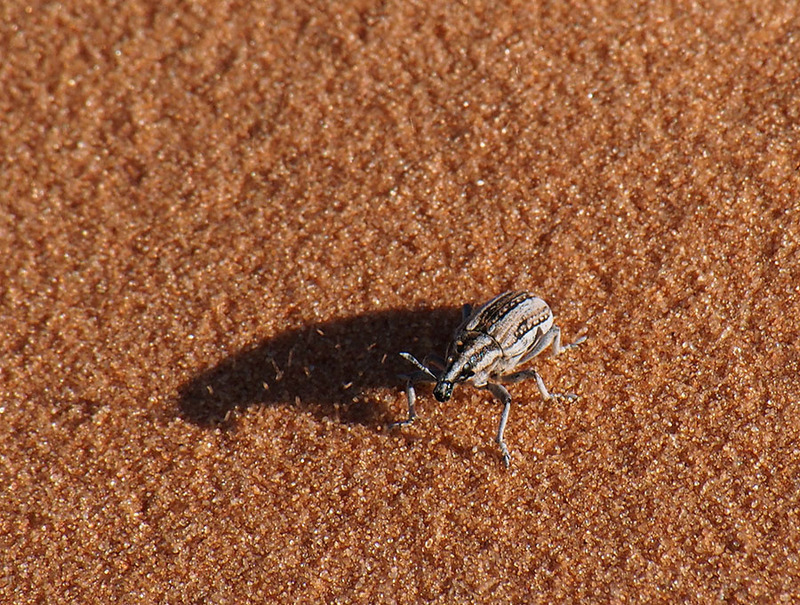 We didn’t see the endemic Coral Pink Tiger Beetle, but we did spot a funny little beetle near the top of a tall dune, clinging to the sand despite the strong wind. The dunes made a wonderful playground for children and families, as well as bigger kids like us… climbing up and down the dunes… …exploring the patterns in the extremely fine, soft sand. 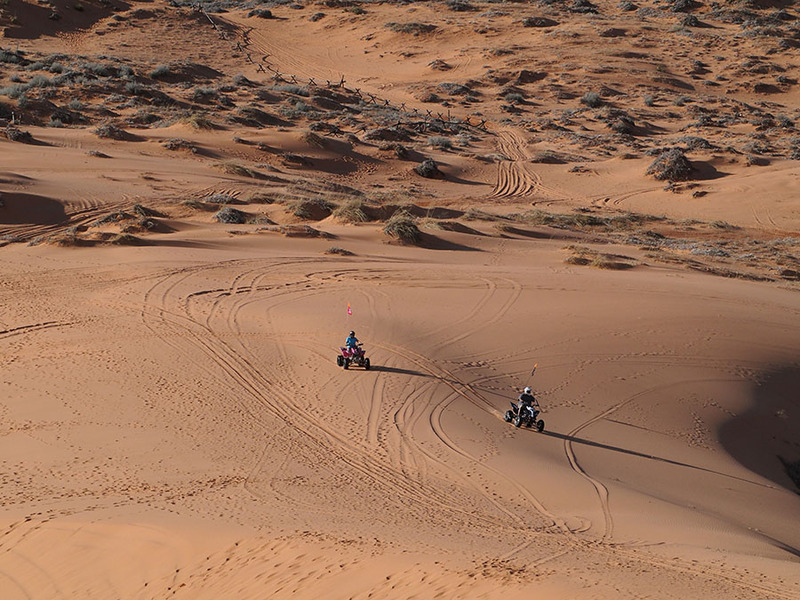 The other big attraction at the dunes is the chance to run around in various types of motorized vehicles – ATVs and OHVs (off highway vehicles). It looked like great fun! 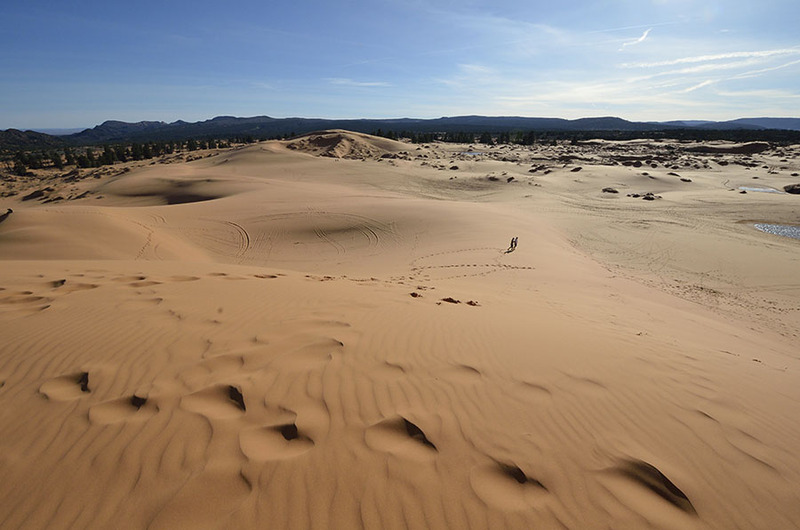 We checked out the campground for a future visit, and we enjoyed talking with the ranger and seeing the huge collection of clear bottles with sand from all over the world… showing how very fine this park’s coral pink sand really is. 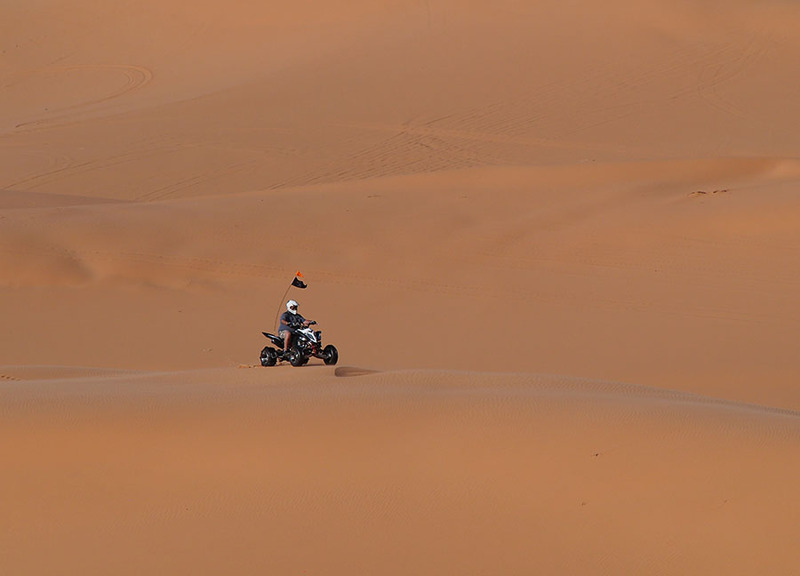 You can also borrow a sand board (like a snow board) from the ranger station, and surf the dunes… but it’s a long, hard slog back up the dune.